It's very tempting to begin this write-up with yet another long lament on director Steven Soderbergh's early retirement, but I'll keep it short: dear Steve, this isn't the one to go out on. It's good and everything, but, it's not the one to go out on. Side Effects is a curious concoction, a straight-playing guilty pleasure that lulls you into a procedural-style stability before introducing a touch of sensationalist camp. Perhaps it is its own side effect, the result of a long bender in which Soderbergh and writer Scott Burns overdosed on Verhoeven and Polanski and Fatal Attraction and then decided to resurrect Jude Law's crazed character from the equally paranoid Contagion . It's a dizzying ride, surprising in ways that place it in a class just above your average thriller in spite of its modest trappings. Soderbergh has, of late, become a director interested in taking common newspaper narratives and fracturing them in ways that speak to our cultural attentions in ways both entertaining and quite revealing. Where Contagion fussed over national health and The Informant! looked at food and business, Side Effects begins as a film concerned with the chemicals we use to control our bodies...and ends as something very, very different. I'd urge you, actually, to stop reading if you haven't seen the film. While I don't intend on revealing any of its secrets, absolute ignorance is recommended for the optimal viewing experience. Side Effects centers on Emily Taylor (Rooney Mara), a troubled woman who finds herself stuck in a deep clinical depression as she attempts to deal with the anxieties that awaken with the return of her white-collar criminal husband (Channing Tatum) from a 4-year stint in prison. 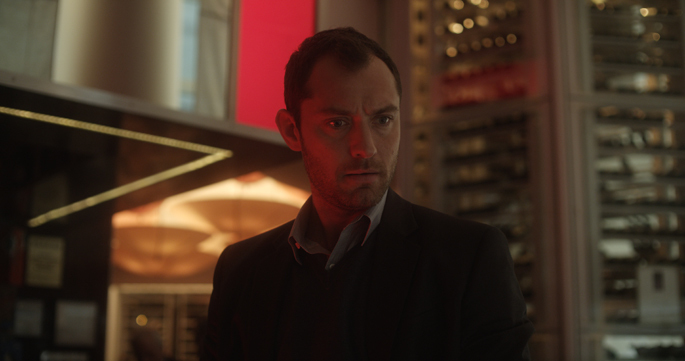 When Emily drives her car into a parking lot wall, she finds herself in the care of Dr. Banks (Jude Law), a well-meaning psychiatrist who doesn't hesitate to write her a prescription for a common SSRI. Unhappy with the results, and suffering from harmful side effects, Emily finds herself moving from pill to pill until her previous doctor (Catherine Zeta-Jones) suggests to Dr. Banks a new drug: Ablixa. On Ablixa, Emily's waking life returns to relative normalcy. She's pleased with the results, and takes them, we learn, in spite of their rather troubling side effects. What begins as a convincing depiction of a debilitating ailment - with Emily channeling all the necessary despondency and frustration - takes a sudden turn towards a winding tale centered, surprisingly, far more on Dr. Banks. It's here, of course, where my synopsis must stop. To tell you anymore would be to deflate some of the film's more surprising victories, which would be a shame since the film's greatest strength is its quiet ability to undermine our expectations. In many ways, the film's structure is fractured to mirror its subject matter. We begin with a seemingly simple set of unhappy circumstances, and as our characters attempt to change them, the story morphs in ways we cannot anticipate. The simpler the solution seems, the more complicated the film becomes, and in that way there is something really quite brilliant about its unconventional, often quite evasive tactics. However, as the film changes, it occasionally stumbles over itself. What begins as Emily's own quietly creepy story is exchanged for something far louder, and occasionally campy in a way that does a disservice to the perfectly controlled early scenes. It may continue to bite just as hard, but some viewers may find that they've already started to go numb. Still, if you're able to take the film in stride as I was, to appreciate a bit of the over the top, you'll likely enjoy what Side Effects has to offer.